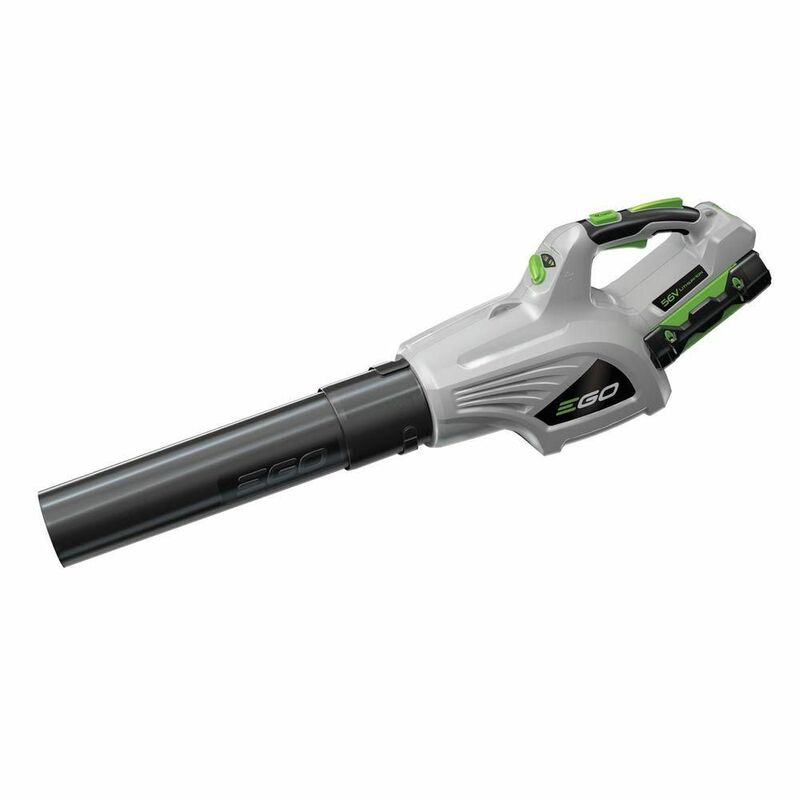 The EGO POWER+ Blower is the first rechargeable blower to perform better than many premium gas-powered models. Turbine fan engineering, inspired by advanced aeronautics technology, delivers industry-leading power. The lightweight, compact, high-efficiency brushless motor delivers longer run time, low vibrations and an extended motor life. The advanced EGO POWER+ 56V battery uses industry-leading Arc-Lithium technology to deliver Power Beyond Belief and is compatible with all EGO POWER+ products. 92 MPH 480 CFM 3-Speed Turbo 56V Li-Ion Cordless Handheld Leaf Blower with 2.0Ah Battery and Charger The EGO POWER+ Blower is the first rechargeable blower to perform better than many premium gas-powered models. Turbine fan engineering, inspired by advanced aeronautics technology, delivers industry-leading power. The lightweight, compact, high-efficiency brushless motor delivers longer run time, low vibrations and an extended motor life. The advanced EGO POWER+ 56V battery uses industry-leading Arc-Lithium technology to deliver Power Beyond Belief and is compatible with all EGO POWER+ products. 92 MPH 480 CFM 3-Speed Turbo 56V Li-Ion Cordless Handheld Leaf Blower with 2.0Ah Battery and Charger is rated 4.5 out of 5 by 1517. Rated 5 out of 5 by Tammy from Love this blower. Does exactly what I need it... Love this blower. Does exactly what I need it for. I would recommend buying it! Rated 5 out of 5 by yard dog from power and convenience I bought this partly as an efficient way to get a second batter for my excellent Ego14" chainsaw, and because I was tired of hauling out a massive extension cord to run my ancient B&D blower. Simple, easy to use, powerful enough for wet leaves stuck to the patio, and can do my whole yard on one charge. Rated 5 out of 5 by Ringer from Ease of Use This leaf blower is great!! It is not too heavy, is easy to use, the rechargeable battery is easy to connect/disconnect and the blower itself is not really noisy. I have used it as a leaf blower and also as a snow blower to clear sidewalks, etc. after a light snow. It was great! Rated 4 out of 5 by Dsam from Pleased Easy to use, very powerful, light weight and the battery seems to last fairly well. Rated 5 out of 5 by babybuddha from All the Power is here! Fantastic product and brand Initial charge was 20 minutes and the ones follow were approximately 50 minutes. For usage on a 4 car double driveway. A single charge will last approximately 5-6 grass clipping clearing from driveway. Extremely powerful especially in "Turbo" mode. I really like the lower blowing speed mode so it doesn't blow to neighbours property! Now looking for other EGO products like trimmer and lawn mower. Rated 4 out of 5 by Burr from Expensive second Battery I love the actually blower, easy to use, light weight but the cost of a second battery is ridiculous, I could have and probably should have bought a second blower as a kit as it was cheaper than the second battery alone....lower the cost and I will buy more. Does EGO model # LB4801 and SKU # 1000787137 include battery and charger? It sure does, Harjo. This blower kit contains a 2.0Ah battery and standard charger. Thansk for your question! Is it safe to use this for blowing snow? Hi Doug! Our recommendation is to only use the blower in snow when it's not actively snowing or to really limit your use of the snow blower in snow. does it come with the battery and charger? Yes, this includes one 2.0Ah battery and standard charger. Yes, extra batteries are available. Simply search &quot;EGO battery&quot; on homedepot.ca for options and pricing. Is the battery compatible with the EGO Lawnmower? Yes, all EGO Power+ batteries are completely interchangeable between all EGO Power+ tools. The only difference is run time. The run time on the mower will be shorter when using the battery that comes with the blower. Does this include a battery charger? Yes, this blower comes with a 2.0Ah battery and standard charger included. It seems that this product does not have a &quot;lock-on&quot; option ... but the on button must be pressed continuously. See below. How about an attachment that funnels the blower rather than the large round opening? Thank you for your observations and suggestions. We will pass them along to our product development team for consideration.